It's my pleasure to welcome Shannon Donnelly to the salon today for a tour around the Tuileries! Lady Chance—the follow up book to Lady Scandal—comes out this August, and one setting plays a part in the story. 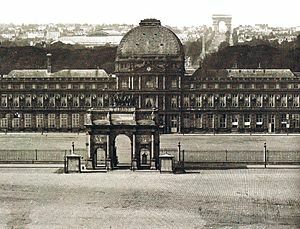 The Tuileries Palace no longer stands, having been destroyed during the Paris Commune of 1871 when it was looted and burned. Since its destruction, the Louvre courtyard remains open—the Carrousel du Louvre (the name carrousel referring to an equine demonstration now commonly called military drill, which used to be held in these open areas). The Tuileries Garden, or Jardin des Tuileries, still are in place. But in 1814, the Palais des Tuileris was a symbol for Louis XVIII’s return to power. The structure had served as a royal palace since its construction in 1564. The original building was extended over the years until it closed off the western end of the Louvre courtyard. 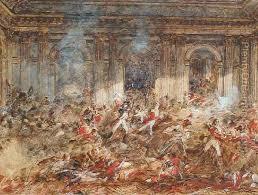 During the French Revolution, the palace had an unhappy time. Louis XVI and his family had been forcibly removed from Versailles and brought to the Tuileries. For two years, they were kept as virtual prisoners, always under watch, and always with the threat of death in the air. The palace became a frightening place for the royals. It was big enough a palace, however, that the National Assembly held its deliberations in the covered riding arena, the Salle du Manège, which ran along the north end of the Tuileries Gardens, west of the palace. Escapes were planned for the royals, but Louis XVI hesitated. In 1791, he finally tried to leave, but he and his family were captured within a day and taken back to Paris. On August 10 in 1792, the mood in Paris turned sour. The Terror was being born, and the people believed the king plotted with the Austrians and his Austrian wife against France. A "mob of terrifying aspect" broke into the Tuileries. The king’s Swiss Guard fought to defend him, and were brutally massacred. The royal family fled through the gardens and took refuge with the Legislative Assembly. The dreaded Committee of Public Safety now met in the Pavillion de Flore. The pavilion had been built to extend the Grande Galerie, which formed the south face of the Palais du Louvre, and linked that palace to the Palais des Tuileries. At night a single lamp illumined this huge deserted hall, peopled with terrible memories. These I would often muse over as I stopped at the spot once occupied by the chair of the president, where Boissy d’Anglas had saluted the bleeding head of Feraud, and where Thuriot had listened impassively to the outburst of Robespierre at bay: ‘President of assassins, once more I ask your ear !’ I saw in imagination…the crowded tribunes; I fancied I could hear the shrieking clamour of the ‘tricotueses’ and the drums of the ‘sections’ hastening to the attack or to the rescue of the Assembly; and I would call up one or other of the acts of the mighty drama of which this sinister hall has been the scene. In 1799, General Bonaparte came to power as First Consul. He was aware of the symbols of power and how to use them, and made the Palais des Tuileries—that palace of kings—the official residence of the First Consul. When he crowned himself emperor, he made the Tuileries an imperial palace, and in 1808 ordered the construction of the northern gallery, which connected the palace to the Louvre, where he stored much of the plunder he had brought to Paris. The Emperor had the Palais des Tuileries redecorated in the Neoclassical Empire style to make it a fit palace for his empire. In 1814, Napoleon was out and the Bourbons returned—Louis XVIII made the Palais des Tuileries his royal residence in Paris. It was said that Marie-Louise, the only surviving child of Louis XVI, never got over her dislike of the palace—memories seemed to haunt her and the first time she returned, she fainted. For a time, the place glittered with balls and entertainments. The Salon d'Apollon was used for informal dinners. For state balls, refreshments were set out in the Galerie de Diane and guests moved from there to the Salle de Maréchaux, which took up two floors of the central Pavillon de L'Horloge. The huge Salle de Spectacle was used for weddings or important fêtes to entertain visiting sovereigns. On May 23, 1871 the palace’s history ended. The library and parts of the Louvre were also set on fire by Communards and destroyed. The Louvre itself was only barely saved. The ruins of the Tuileries stood for eleven years before the decision was made to tear them down—the symbol of French monarchy in Paris was gone, and along with it went hundreds of years of history. With the disappearance of the palace, the Arc de Triomphe du Carrousel—built between 1806 and 1808 to serve as an entrance of honor at the Tuileries—became the dominant feature of the Place du Carrousel. The gardens of the palace, opened to the public by the French Revolution, remained. Oddly, the furniture and paintings from the palace survived the fire. They had been removed for safe keeping in 1870 at the start of the Franco-Prussian War, and remain in storage. France talks of rebuilding the Tuileries, so that these treasures could be again put on display, and the Louvre could expand its displays. So perhaps the palace will again be, as Charles de Gaulle once said, "a jewel of the center of Paris." In the evening Jules took her to the Palais des Tuileries for the fireworks, and dancing in the palace. They had forgone the events of Notre-Dame—King Louis’ arrival and his speeches. Diana was a little sorry to have missed it. The last she had seen of the cathedral it had been turned into wine storage by the revolutionaries. And Madam Blanchard’s balloon ascension from the Pont Neuf might have been amusing, although nothing would ever convince Diana to go up in any such contraption. These days, standing on a chair left her dizzy and needing to grab the nearest solid object. On shore again, it was but a short stroll to the Palais des Tuileries. By taking to water, Jules had avoided the crush of carriages that lined the formal paths of the Jardin du Carrousel and the army camp. The wait seemed long wait to arrive before the palace steps. Lit by flambeaux and lanterns, the ornate stone of the palace looked fit for a fairy tale. Diana leaned back to gawk like a girl in her first season. Jules presented their invitation and, along with a flow of guests, they stepped into the grand hall. All of Paris seemed to be here, milling about in the Salle des Maréchaux—eighteen marshals’ portraits hung high on the walls. Diana glanced up from the crowd and to the portraits of Bonaparte’s marshals. The Bourbons had not got around to replacing them, or perhaps they wanted and needed the marshals to keep the army’s support and so permitted the portraits to remain. What odd alliances were being made. “Too bad he did not take such a hint,” she told him. She followed him into the yet another crowded assembly room. The heat hit her first in a wave. Hundreds of candles dazzled the eye and the close-packed assembly added to the warmth. Everyone who was anyone in Paris would be here tonight. Louis XVIII obviously wanted to make a grand impression. Diamonds glittered upon the ladies like fallen stars. Uniforms dotted the crowd with bright splashes of red, blue and green. Gold braid and medals gleamed. The noise of so many voices seemed more like a grumbling beast. Snapping open her fan, Diana plied it and clung to Jules’ arm. He took a wandering path through the crowd, using polite bows and a scattering of smiles to part the way. Talk flowed with gossip and speculation, worse natter than anything in London. Would Louis keep to his vow to uphold a constitutional rule? Would his supporters allow such a thing? Would the army insight another revolution? 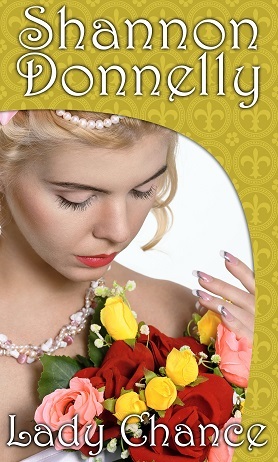 Was the dauphin really still alive but in hiding? Would he return to take the throne from his uncle? Would hemlines continue to go up and necklines further down? How long would foreign armies occupy Paris? She did so, and found the king too old and filled with gout to do more than sit in his chair and smile at her. Louis XVIII, she knew, had once appointed himself Regent of France from outside France’s borders. Meaning he had long had his eyes upon the throne. His advisors hovered close—close to power, she thought—including his younger brother, the charming comte d’Artois, and Prince Talleyrand, who had kept the power and title he had gained under Bonaparte. L’homme girouette some called him—the weathervane. He’d been one of those who’d send his king to his death, he’d been at the heart of Napoleon’s empire, and now he’d managed to retain a place close to the Bourbons. A shiver chased down her back. If the dauphin were to be revealed, how would a boy survive these men? Oh, but that poor child would be a man himself by now, and one forever changed by his terrible experiences. She dropped to the floor in a deep curtsy to the king, and decided she would not care to play cards with him or any of these smiling gentlemen. She would not trust them to keep the play fair. Fortunately, all that was required of her was to smile and remark on silly things. Taking her across the room, Jules stopped before Taliaris. “Major, my cousin who is known to you already demands I make her formally known. Do I…?” With a wave of his hand, he let the words drift. She held out her hand. It was brazen of her, but she was a widow and not some miss who must hang back and pretend coy simplicity. Short of churlish behavior, the major could do nothing other than offer his arm and lead her out. He did so. She glanced up at him to see what sort of mood this forcing of his hand had given him. “Well?” she asked as they faced each other and waited for the musicians to strike up the first notes. This post copyright © Shannon Donnelly, 2015. You can find out more about the glittering Bourbon court in Life in the Georgian Court, now available to order worldwide! Thanks so much for having me as a guest blogger on A Covent Garden Gilfurt's Guide to Life.